C.M. 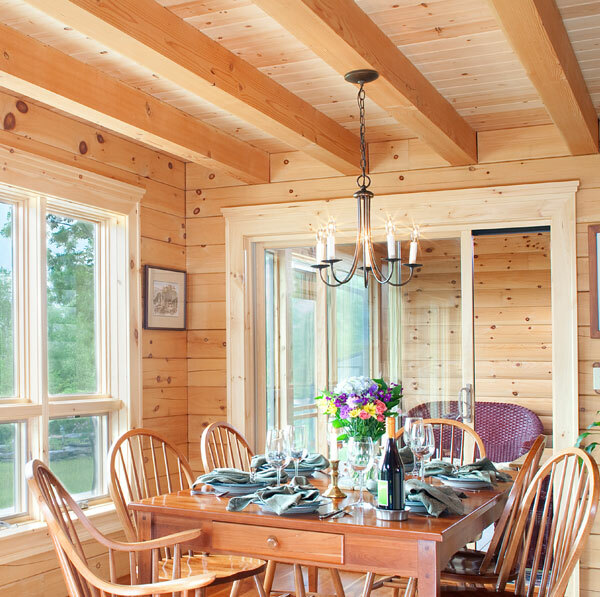 Allaire & Sons is committed to using high quality materials on all of our log home projects. Premium graded logs, Andersen Windows and Therma-Tru doors are standard with all of our homes. The result is a beautiful home which will provide generations of comfort and enjoyment. We use only premium logs cut from the heart of the tree. To prove this, all of our log homes are graded to the standards provided by the Log Homes Council, and come with their own grading certificate. 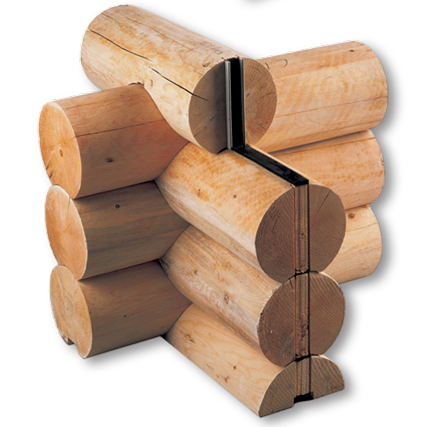 Never settle for anything less than graded logs for your log home. To reduce the checking (or cracking) in our log walls, we never kiln dry our logs. This process stresses the logs and creates unnatural checking. Instead we air dry them so the drying process occurs naturally. Our logs are also wider than they are tall, which minimizes checking along the exposed log surfaces. Eastern white pine (left) or Western red cedar (right). This is our most popular profile. It features a rounded exterior and interior look and a uniform appearance. The V-Groove profile is uniformly rounded outside and flat inside with a tongue & groove look. Available in 8”, 9” and 10” widths, our massive Swedish Cope logs use an appealing “saddle notch” corner for a more traditional look. 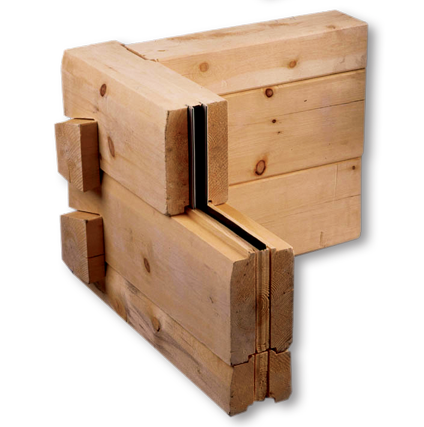 Our rustic log profile uses logs that vary in width from 8” to 11.” The rough textured finish creates more of a classic log home look. This design uses massive, 11” tall logs fit with a distinctive dovetail corner detail. 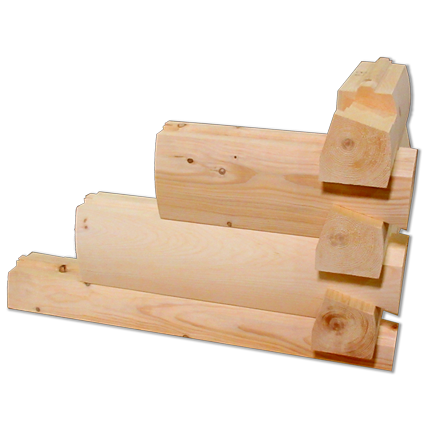 The dovetail design is also available using our standard 7” tall log profile. The exterior will be round while the interior will be flat. This log profile mills solid log timbers to look like a clapboard house. 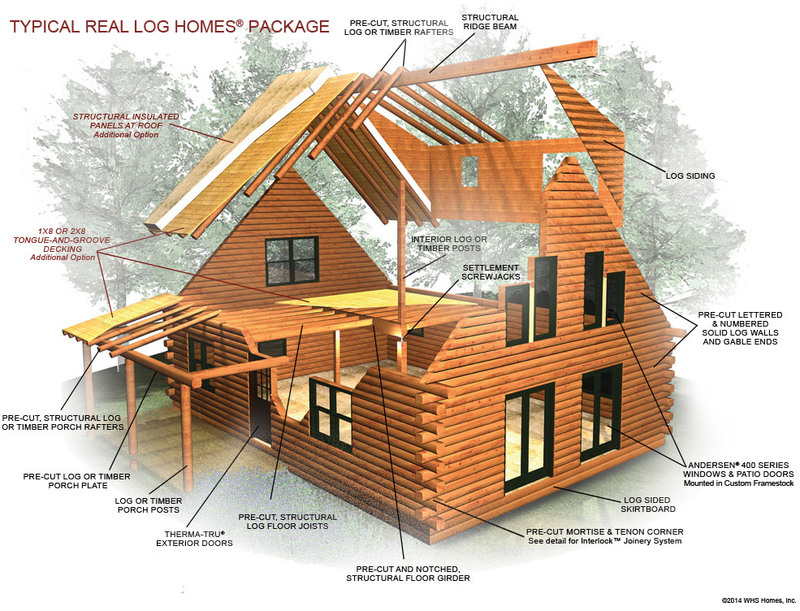 It’s a perfect way to build a log home in a residential neighborhood. Using what we call the Interlock Joinery System, our log homes are built to be weatherproof and draft-free. 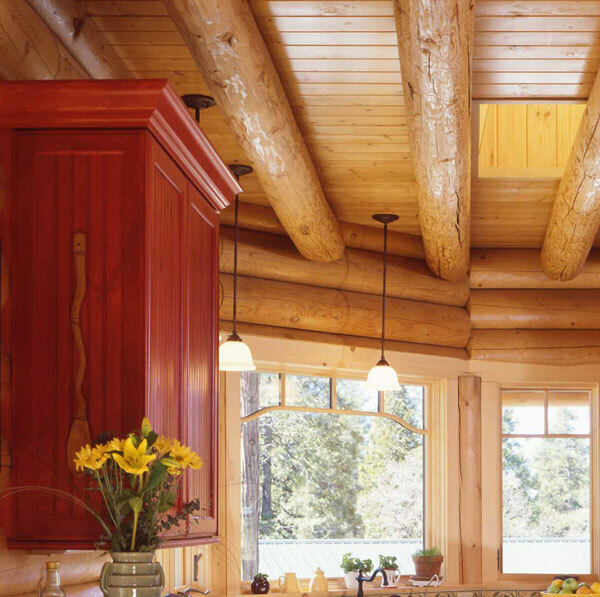 While many log home companies seal with little more than caulking, Real Log Homes are manufactured using a sophisticated tongue and groove system. 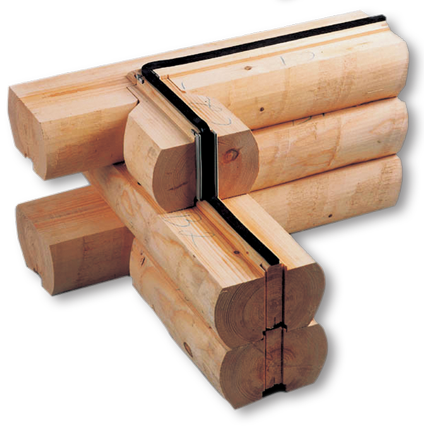 The system incorporates durable foam gaskets and PVC Locksplines to seal all joints between logs, at windows/doors and at corners. 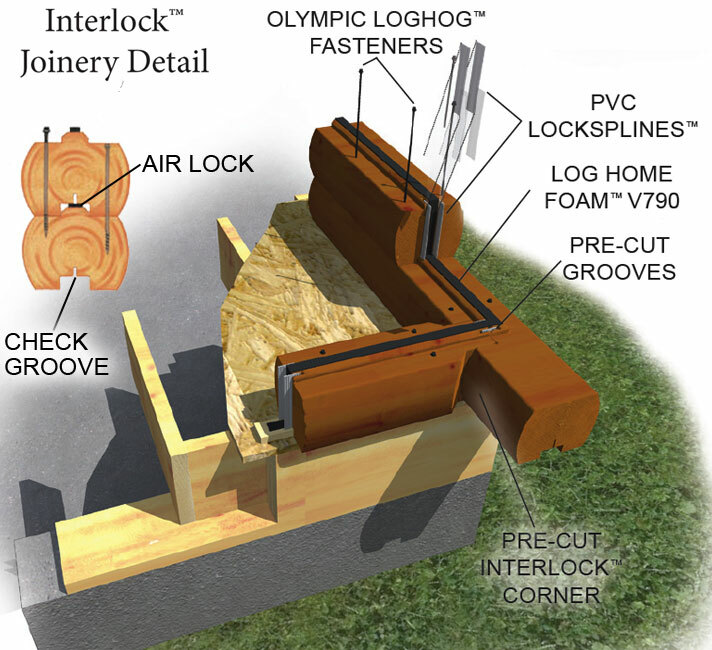 Logs are tightly connected using Olympic OlyLog® fasteners. 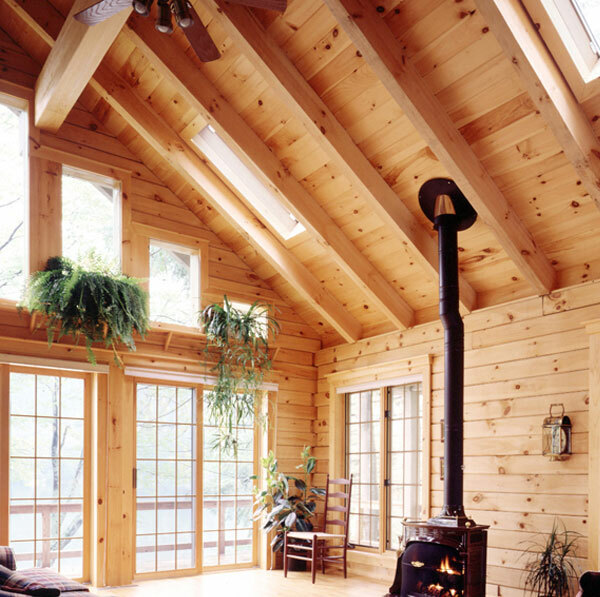 You won’t find a log home joinery system that is more weatherproof or one that requires less maintenance. The graphic below shows our standard log package components. Keep in mind that that any of our homes can be customized to meet your style and budget. 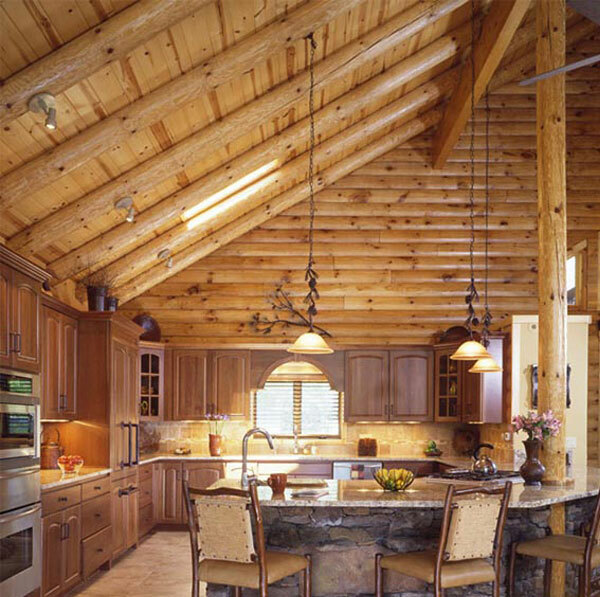 Full round log roof rafters create a truly authentic look in the roof area of a Real Log Home. All rafters are precut and notched for a tight, precision fit. Square timber roof rafters provide a cleaner, more uniform beamed look. 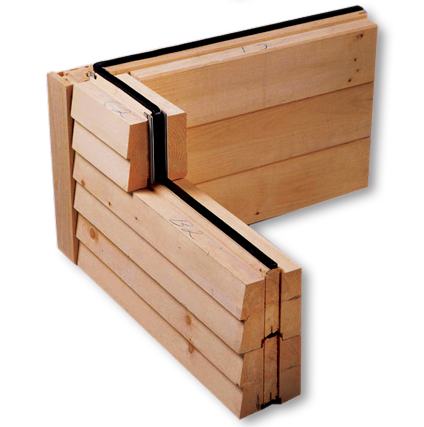 Timber rafters are available with either a rough sawn or planed finish. Our standard beams for second floor support are full round floor joists. 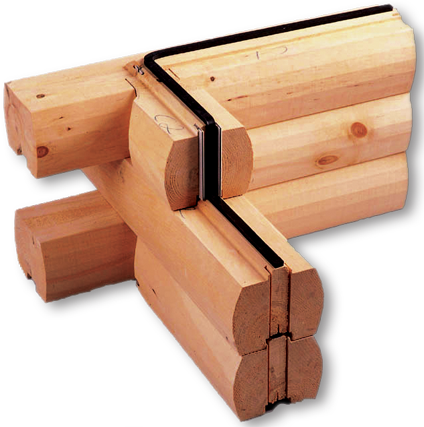 All joists are precut with tenons which fit into log wall notches. Milled at a minimum diameter of 7”, they are truly impressive to behold. The more finished look of square timber floor joists are also available for second floor support timbers. 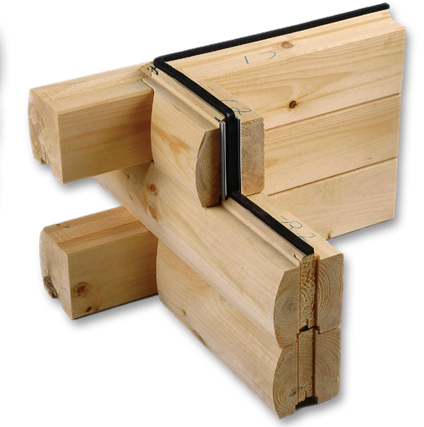 Timber joists are made to fit into precut wall and girder notches. Want to learn more about the high quality logs and building materials that we use on every job?